I have a confession. I have a weakness for anything made from glutinous rice flour. Be it tang yuan (glutinous rice balls), muar chee (a Malaysian snack), mochi (a Japanese snack/wagashi), or mochi bread – I love it all. There’s just something about the chewy goodness of glutinous rice flour that makes it so irresistible, to me at least. It is this weakness for glutinous rice flour that led me to be intrigued the moment I saw Y’s post on mochi cupcakes. Cake + mochi in one? Could it work? Well, there was only one way to find out: to try it out for myself. And I can very categorically say that yes, cake + mochi work exceptionally well together. It’s hard to find the right words to describe the texture of these babies, and the best I can do is to say they are “chewy but not overly heavy/cloying”. Those of you who have eaten food made from glutinous rice flour will probably understand what I’m getting at, but I’m betting that the rest of you will have no idea what on earth I’m going on about. Maybe one of my readers can help me out here? But as I was saying, mochi cupcakes are yum. What I also like about them are the endless number of variations one can have – flavours I’ve made so far are matcha (green tea), blueberry, cherry and most recently these fig ones. Plus they’re gluten free! I have plans to make chocolate or peanut butter ones in the near future, so stay posted for that. 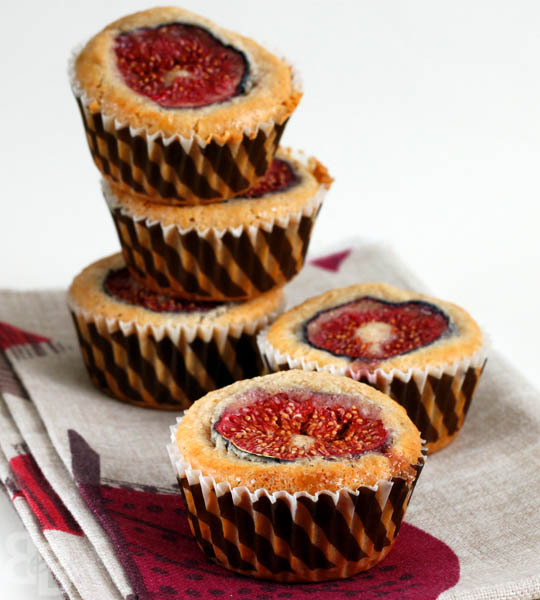 I’m sending these fig mochi cupcakes over to the lovely Deeba of Passionate About Baking. She’s a fantastic baker who manages to churn out all sorts of delicious baked goods even in the sweltering Indian heat, and is hosting this month’s Monthly Mingle which is themed “Fruit in Baking”. I’ve never actually taken part in any blog events, but I guess there has to be a first for everything! 1. Preheat the oven to 175’C. 2. Line a 12 hole muffin pan with muffin cases, and set aside. 3. Sift the glutinous rice flour, baking powder, ground cinnamon and mixed spice. 4. Whisk eggs and sugar until light and fluffy (I use a stand mixer, but you could just as easily use a handheld electric mixer). 5. Fold in the melted butter into the egg/sugar mixture, followed by the evaporated milk and vanilla bean paste. 6. Fold in the sifted dry ingredients in two batches. 7. Pour the cupcake mixture into the prepared muffin cases (make sure to only fill it to about 3/4 full, or it may overflow). 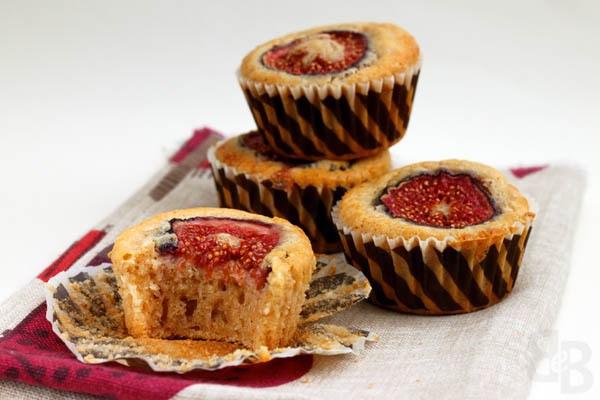 Place a fig slice in each muffin case, and sprinkle with demerara sugar. 8. Bake for 20 minutes, or until a skewer inserted into the middle of a cupcake comes out clean. i love love LOVE your mochi cupcakes… i have to say I think the matcha ones were my favourite, but you shouldn’t be surprised about that 😉 These fig cupcakes were soooo good too! please make some more ! I do have to make more matcha ones, maybe I could make matcha chocolate chip ones! Mmmmm…. Mochi cupcakes?? are they chewy? Yup they’re chewy – but not as chewy as something like tang yuan/muar chee. It’s a bit like a “non-wet” chewiness, if it makes sense? You must try making them, if you like tang yuan you’ll love these. OMG!!!! I absolutely love anything with glutinuous rice…I once spent hours making my own tang yuan with flavours that i Like. The chocolate was good. Pineapple was not such a good thing. I have not even thought of mochi cupcake…thanks for the recipe…I want to make the matcha ones. Do i just replaced the figs with the matcha? I love mochi cakes! I’ve made a lot of different flavors. The figs look so cute in yours. I share your love for mochi cakes, they’re just so addictive. OMG! These are flipp’n gorgeous! I love the way the look and they sound darn delicious. The pictures are stunning! Like you, I love glutinous rice flour. I definitely making this. Lastly, I love those cupcake papers. Yay I’m glad you like the sound and look of them! You must try making them, they’re gorgeous. And the fact that there’s so many flavour variations is even better! I think it’d work well with any fresh fruit, to be honest. I’ve used cherries and blueberries which were yum. Do post it on your blog if you try making them. I love the idea of these being both chewy and light! 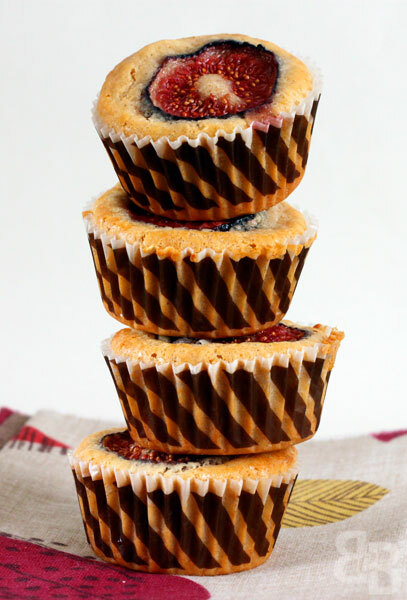 I have to say this is the first cupcake/muffin (don’t know why but it must be the fruit that makes me think of muffins!) in a long time that really appeals to me! i have never baked with glutinous rice before. this sounds very interesting! They are – a one of a kind texture, which you can’t really get with anything other than glutinous rice flour. Haha! I finally get to see your mochi cakes over here!!! Been waiting ya know! LOL! I dunno if I’m not looking hard enough!!?? I can’t find fresh figs in KL! I only dried ones, which were bought from a Middle Eastern grocer. Haven’t used them though, been wondering what shall I do with them …. being the always-indecisive me. Alright, I shall wait for your choc-peanut butter version as that flavor combo crossed my mind too! Sadly, I got distracted! HAHA! Btw, Ann is coming back to KL and we are working on a meet-up with other bloggers. Are you coming back, too? Drop me a mail, if you have time and would want to. Can find my email address on my blog. Maybe they’re just not available back home, Swee San said the same thing as you about only having dried ones back home. They should work with dried figs as well I think, but will just be slightly less pretty. These look so adorable and I bet they’re super delicious!! I love anything with glutinous rice flour too! Esp tang yuan and mochi. I’ve made mochi cakes quite a few times, with different variations. They taste so yummy. 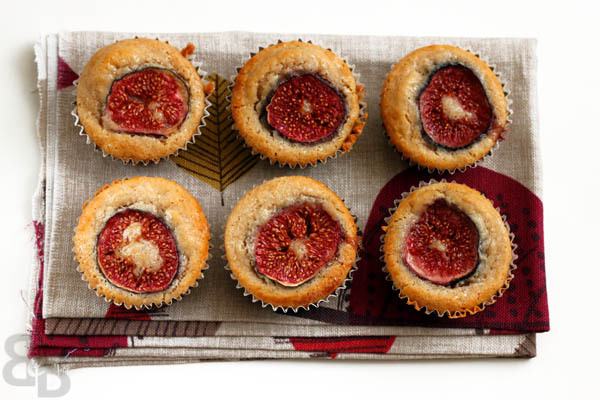 Never tried making fig cupcakes though! Your figs are so pretty. The ones I buy aren’t usually red inside. It might be because I bought them from Waitrose – never actually bought figs before this (shocking I know) so can’t comment on their redness! Oh my gosh, combining two of my favorite things! These look brilliant, the stripey cases look great next to the red of the fruit. Is all rice flour glutinous? I thought rice flour was gluten free? Hi Sarah, you’re right to say rice flour is gluten-free. That includes glutinous rice flour – the “glutinous” simply refers to the fact that it gives a sticky/chewy/gluey quality to whatever you’re making, as opposed to “glutenous” which means that something contains gluten. It’s made from glutinous rice aka sticky rice, which is used in lots of South-east Asian recipes. It doesn’t mean that it contains gluten, as it’s the starch composition that makes the end product sticky. It’s also called sweet rice flour. Hope this helps! They look fantastic! 😮 I’ve never tried this combination before but I am really curious now! Gorgeous Su-yin…very attractive and pretty! Intriguing too…love what you did with them! 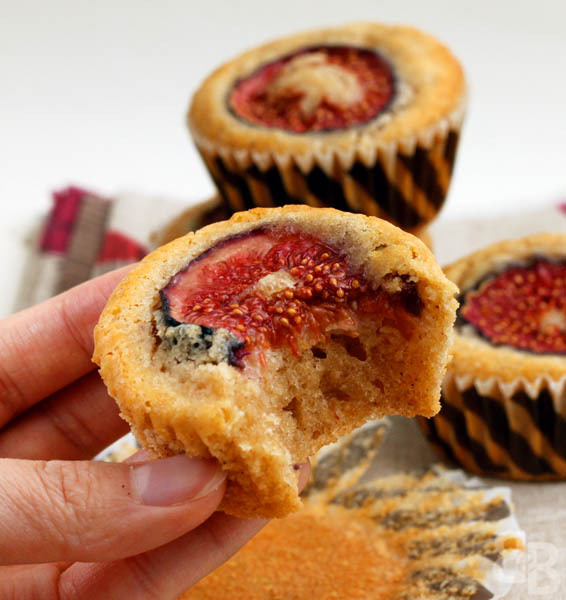 I love how you used fig in these mochi cupcakes!! So pretty. Oh Ellie coming from you, that’s a compliment indeed. Thank you, and I’m glad you like them. YUM YUM…so happy they are headed my way! I love the offbeat stuff you did with them! Thank you for the mention, and sweet words my lovely! Those look beautiful! I do love seeing all the lovely exotic cakes you make. How intriguing. I have never cooked or eaten anything like this. Thanks for sharing. they look wonderful. I must try to make something like this! Lovely photos too! !